Most of us will probably never win a Grammy Award, or a Pulitzer, a Tony or an Academy Award, or ever even be nominated. But that does not mean that the music we make is unworthy of national recognition and reward. I am proud to be chief judge of the The American Prize—because it is the national competition for the rest of us. And for twenty-five years, I’ve also conducted an orchestra of lawyers in Chicago. Of course, I would have applied. What if your audience, donors or membership woke up to the news that you had just won The American Prize, judged to be the finest in the country in your category, chosen by an impartial panel of experienced professionals from all across the United States? There would be prize money, of course, but more important would be the bragging rights, to be emblazoned next year on your brochure, or printed in your church newsletter, or announced at the next faculty meeting. There would be the award certificate hanging proudly in your rehearsal room, office or auditorium lobby; there would be articles in newspapers and magazines pointing to your winning performances, all linked on The American Prize website. This spring, somebody (a group of somebodys) is going to win The American Prize and be recognized for artistic achievement. Why not you? Applicants to The American Prize need not prepare a special tape for the competition. Previous recording(s), (CD, DVD or VHS video) whether of a concert (or concerts) made in front of an audience, or one(s) created in a recording session without an audience, are absolutely acceptable. The minimum length is 30 minutes, with the understanding that judges will likely not listen (or watch) everything on longer recordings. We have added an additional email address for the competition. Applications (and questions) can be emailed to either the new GMAIL address or the older AOL address starting immediately. The postmark deadline for the spring 2010 competitions of The American Prize has been extended to March 15, 2010 to accommodate anyone who encountered problems accessing the website in the past two weeks. (The competition's internet service provider chose this time period to move The American Prize website to a new server; the transition did not go as smoothly as they had promised.) All other published deadlines for the competitions remain the same. We will continue to welcome applications from orchestras, choruses and their conductors through March 15th. Additional competitions for 2010 will be announced on the blog, website and facebook pages on March 1st. 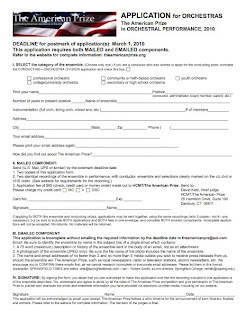 Should you encounter any problems with The American Prize website (which has recently been moved to another server by our service provider) below please find quick copies of the four spring 2010 applications to print out. Should you encounter any problems with The American Prize website (which has recently been moved to a new server by our service provider), here is a quick copy of the orchestral performance application to print out. Should you encounter any problems with The American Prize website (which has recently been moved to a new server by our service provider), here is a quick copy of the choral performance application to print out. Should you encounter any problems with The American Prize website (which has recently been moved to a new server by our service provider), here is a quick copy of the orchestral conducting application to print out. Should you encounter any problems with The American Prize website (which has recently been moved to a new server by our service provider),, here is a quick copy of the choral conducting application to print out. 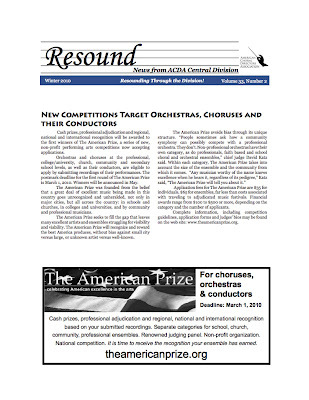 The American Prize has received excellent visibility in an article and advertisement in the winter issue of Resound, the print and online publication of the Central Division of the American Choral Directors Association (which is available on their site.) 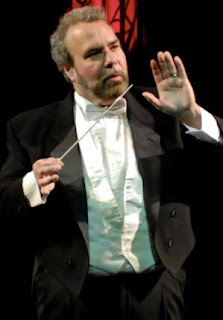 In addition, the Pierre Monteux Conducting School has forwarded the press release and web links to its entire alumni list; as has The Conductors Guild to its membership. Judge Leonard Atherton will be speaking about the competition to a winter meeting of CODA, the College Orchestra Directors Association; The American Prize is listed in print and online editions of Musical America; it will soon be found on Wikipedia.